Toxic Trails, Afflicted and Last laugh for 100cm. Toxic trails, Afflicted for 99cm. Can they at least have triple rewards for that amount of cancer? Toxic trails should have been removed and not thrown into good content. Toxic trails, Afflicted + adds means entire green ground that kills in seconds without a healer. I want fractals to reward skillful play and not requiring healbots for unavoidable damage mechanics. Or am i alone with this opinion? A healer can outheal most of it but without one fighting siax with this instabilites could be one of the worst experiences in the game right after mai trin without a healer. I mean if you pull group up and cc the ads in one spot the map doesnt fill with greens. Id call that skillful play but thats just me. The oppening week has some good memes i must say. Also why does 99cm have only 2? Thats a wierd outlier. Because no pain no gain does nothing with a spellbreaker in the group. Pull has a 5 target limit. Mama and 100 2nd boss spawn more than 5 adds or have breakbars and can't be pulled at all. Thats the pull skill i meant. Most other pulls are inferior or pull adds onto you which would just kill you with toxic trails. The dh can also just pull and dodge right after or pull in traps and cleave. Dunno if it's intended or not but adds at Artsariiv don't kick you away when they explode, the anomaly in the whole frac does neither. Id assume for the anomaly its intented. Hmm, toxic trail patches of knights were inconsistent (no larger trails) and of some other mobs too. This is poorly implemented or doesn't work properly due to whatever. The trails on solar orbs in 100CM at Arkk made me laugh so hard. As I said, this is not challenging, it's just annoying. Disable last laugh, toxic trails, and adrenaline rush on little viirastra adds as well as the anomalies. If certain combos prove to be consistently bad, I can see about adding a mutual exclusion list, so that for instance last laugh can never happen with toxic trails. However, I'd rather try rebalancing the instabilities instead. last laugh and toxic trails could use tweaks I think. 100CM Astariiv fight right now is horse kitten. Last laugh, toxic trail, and fractal avenger piled onto a fight that is extremely heavy in small adds moving around and dying constantly, on top of a fight that already has a ton of ground aoes happening is nonsense. It's a level of artificial difficulty and stress on a fight that was already at a good level for gauging a team's ability to work together and pull their own weight. It's just frustrating, chaotic spam. It's hard enough to get a pug group for 100cm without the rage quits happening because of this. But thanks for not adding social awkwardness to 99 and 100 I guess. I'd say Last Laugh needs to go bye bye for any boss that summons a bunch of adds, with the exception of the Ice Elemental (because most of the time you're leading them around). So Viirastra for sure, and I'd include Mai Trin, Bloomhunger, and Twilight Oasis as well. Getting killed by last laugh on the priest of Grenth or the priest of Balthazar? UGH. Or being killed by last laugh on the golems in Chaos? UGH! 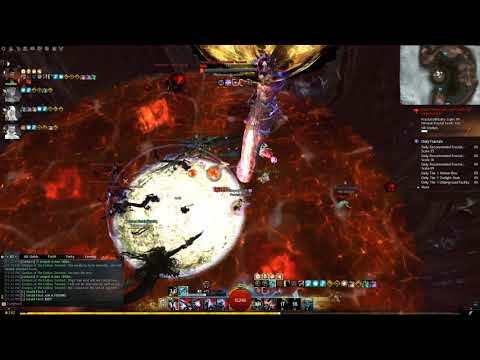 Toxic trails and Hamstrung should be reduced or prevented on any fractal where your positioning is absolutely critical -- TT has been a nuisance for a long time on Cliffside, but imagine the golems on Chaos making it particularly untenable to avoid taking damage from the floor or the boss AoE. Adrenaline Rush on high damage bosses is currently quite lethal (looking at you MAMA). I'd recommend toning it down for those specific bosses. Dont het how ppl have such a big issue with last laugh. Group up adds, cleave, dodge, profit. Just did the dailies and cms. Worst one by far was viirastra. We still did it first try somehow but toxic trails + last laugh really hurt in the beginning. The first anomaly can be entirely covered in explosions and toxic trails in the start. Siax was way easier than i thought and mama was harder for us. Best way to deal with last laugh at viirastra was to burst them all down fast with weaver aoes so all adds die fast in one place. This benefits weaver meta even more. The 20 chain explosions on top of each other looked funny though. Rest was fine to be honest. Need more time with mama though, maybe we were just bad. But not having no pain no gain was at least something refreshing in 100cm. I still want to see more instabilities like Flux bombs though. Something that requires a reaction. Artsariiv is basically impossible with toxic trail + last laugh. I was making a meme before this came out "yeah social awkwardness + last laugh + toxic trail on art will be amazing" and yet wow look that what happened. 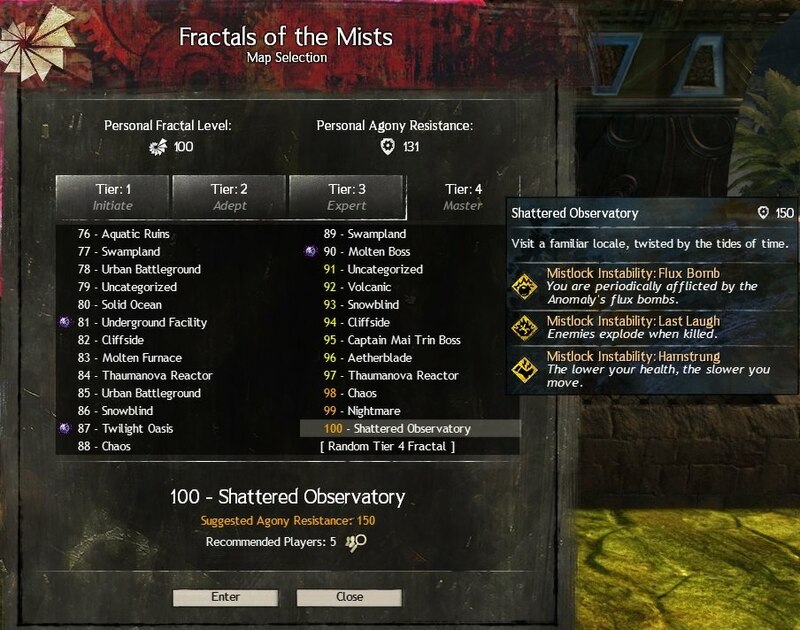 I thought it as a joke and this really makes the whole fractal not fun or even playable. Solutions: last laugh + toxic trail + flux bomb combination just no, or any of those three by themselves, in 100cm as on Arkk or Art the platform is already full of hazard and there's literally nowhere to stand with these. In terms of toxic trail please just remove it, I don't see any point of it at all. Most professions are melee, and toxic trail is just plain annoying especially for classes where you need to stand inside the hitbox for maximum DPS, or like mirage where your axe just teleports you to random places. Last laugh in swampland was also ridiculous as you can't pull those annoying invul creatures when they are not inside the wisp AOE. However it is not as annoying as 100cm. Or if you want to balance it, don't make summoned adds explode-able (i.e. art in 100cm, and therefore only the biggest add can explode, not the multiplied smaller ones). Did 100cm without any issues, i really enjoyed artsariiv with toxic trail and last laugh. Edit: Also 99cm, didn't notice any changes in there. Guess the only difference is that you cannot stand in siax, but thats a very small thing. about adding a mutual exclusion list, so that for instance last laugh can never happen with toxic trails. However, I'd rather try rebalancing the instabilities instead. last laugh and toxic trails could use tweaks I think. More seriously, that sounds like a fair plan. It would be good to see some adjustments to some of the instabilities. Fractals were fine! They were so fine!! Why was this change even considered? Why do we even have instabilities in the first place? The fractals on their own are really fun and engaging and the instabilities make them frustrating and rage inducing. Anet you were supposed to be the chosen one, you were supposed to bring balance to game, not destroy it. Queue Star Wars meme Anet, "I HAVE THE HIGH GROUND!" My entire guild agrees with this btw. Health bars are nice tho, would love to see some more contrasting colors to really pop out to druid mains like myself. They did it for variety. Its a good idea, tbh. They just need to tweak the whitelist, or change how last laugh works. Did 99cm just now. Team was a bit slow on dps, and we had trouble for that reason, I think. Toxic trails was annoying, but overall I think its easier then hamstrung was, and its not like that was hard. Biggest thing, if you screw up and spawn a nightmare halucination, it gets so hard instantly. My feedback, I like randomization, and current 99 ones are fine. The change is just on making the system automated (was surprised to learn mistlock instabilities are manually rotated/coded all these time tbh). The problem with Toxic Trail wasn't prevalent because it was sitting in T3 and never made it above level 86 (high end T4). I always leave any T4 dailies group that attempts to take lower level T4 with Toxic Trail thinking it would be "easier". Didn't this used to be the case ? I can't see a reason for changing it to be fair...If you attempt to balance those instabilities it would have to be around each other making them all individually a non-threat. Wouldn't that defeat the purpose of having them to begin with ? Cliff side does not need Last laugh.. especially when Berserk is a thing as well. every add blowing you over when you or your allies kill any mob, so that means you have to save your dodges almost exclusively for the aoes they leave behind. I would definitely say that toxic trails for viirastra (or what ever she is called in CM ) was problematic...Last laugh is not that bad as with a bit of clever play you can get over it. The trail is more annoying than fun i think. Sincerely, these 2 instabilities of Toxic Trail and Last Laugh in 100 CM, has been very entertaining and more in the second boss, although I admit that it was very difficult. If you do not know properly, how to confront the bosses with these 2 instabilities, it can be very uncomfortable for everyone and more for the healers. This "wombo combo" is very powerful. Well too powerful. I can already imagine merging the 2 stabilities into one: an explosive poison bomb. I think instabilities as whole concept are bad. Just remove them altogether but add new mechanics to bosses (or boss-like encounters). Make bosses challenging using their own abilities. This randomized system is annoying as a whole. Make bosses use new abilities each tier or level, make them interesting. Adding toxic trails or similar things to trash mobs is not challenging. It's annoying. But this could be at least blocked with a well placed projectile block. I'm tired like never before, again it feels like a chore, not fun. Spent like 4 hours on cm+t4+recs. I feel disgusting. Why don't you add random instabilities in raids since it is so much fun and makes the encounters interesting ...make everything random, we will never will have the ability to learn something...so much fun. Really think about it hard and slow, what is your goal with this ? Pug groups will have even harder time, it will be less fun and less people will play fractals unless they have a static group. People will get burned out. It was much more fun when you were able to just learn each fractal better and better. Now with this random stuff there will be times when your group will just struggle if they get a bad combination and there will be more toxic people complaining about others and there will be more kicking. Even if you adjust some combinations there sill be some that are just worse and this toxicity will just be higher than in the previous iteration. yea finished daily fractal run with those randomized instabilities. its hard yes, thus nothing with good coordinated and somewhat experienced group (eg statc) cannot handle. imo the main factor why its so bad for 100cm 2nd boss is not the toxic trail + last laugh combo, but rather toxic trail + afflicted. at this fight there are enough things to hit you for small amounts - every of those granting loads of condis and toxic trail adds poison for reducing heals. condi cleansing works to a point, but if you take too much time.. well. bai. The whole idea of random instabilities is actually great, and for me it fits very nicely with the Arkk mini-story arc, fractals being destablized and stuff. This is a great additon i do welcome, but then i think i already overdosed doing fractals on daily basis. Still good work. That said, some combinations might be quite hard to overcome, and probably would require some playtesting before being alowe to go live. Out of curiosity, has anyone done Bloomhunger with Last Laugh today? If yes, was it as painful as I imagine? 89 with Toxic Trails was quite demanding as a healer (though the pugs weren't particularly bright), but I really don't want to imagine what the 77 mid phases would have looked like. Not sure whether these instabilities are a good thing in fractals where you just get swarmed. Yes, one person in the PuG group (5 dps) made the call for Last Laugh instead of Toxic Trail and we went with it since there's no objection. Everyone adapted mid fight, as I noticed everyone was back-paddling while killing the minions after a while (Not perfectly synchronized, just not getting in the way of the others). I would say he/she made the right call after considering our group setup with no support in it. this change has really killed cm pugs, no one wants to even run this torture anymore. I cant even find a group that wants to try. CM's were absolutely perfect there was no reason to change something no one complained about as being too easy. This was a terrible idea, sometimes i wonder what these ppl think about when deciding on the next "great" idea. I sure wish they would have left cm 99/100 alone. I don't know, my group struggled a bit at MAMA where we had to finish her with 3 ppl and I found myself downed two times on Artsariiv but that was due to missplay and wanting too much during cc phase, so avoidable mistakes by me. We oneshotted all 6 CM bosses and again all it came to my mind was that those instability changes are just annoying but not an interesting mechanic or a challenge at all. It was a 150 KP pug, yesterday 30 KP with some more problems and some wipes. Getting into CMs or having a low number of KP probably is more difficult, but hey that's only guessing by me. Toxic trail on Swamp was no issue at all (it was a new group, not the CM squad). Aoe cleave is taking care of mobs reaching you and harming you via poison. If someone really thinks that has to be changed, CM definitely needs a change too. So no, leave it as it is. Molten Furnace was hardly noticable, same goes for Cliffside where we picked Social Awkwardness over Last Laugh. Picked Last Laugh again for Swampland to avoid Toxic Trails. I do NOT look forward to Oasis tomorrow though. Personally I don't think completely random instabilities are fine for CM. Or at least design them with random fixed combos so they don't include too crazy ones. Also now effort / reward may not really feel worth it for players who wants to get into it. It's daily stuffs and low kp parties may take few hours to get one CM done on bad week (now?). Honestly random instabilities would feel fine for experienced players, but they are very bad (in my opinion) for players who are trying to start running them or have less experience and runs with low kp pugs. It has way too much variations for guides and includes way too much mechanics for instabilities. People just kept dying to instabilities and now mechanics (downed with bombs because of Toxic Trails, knocked around because of Last Laught). Artsariiv was worst. Group went through couple rage quits but they just kept failing. Went through all just fine. Few time people went downed in Artsariiv. Was pretty messy as druid because of CC phases in Artsariiv required way more healing and running around (more spread out group). Went about same as second run. Wiped couple times because of instabilities (downed by them). We had Scourge (lol) though so barriers and removal helped a lot with conditions and random instability aoe. Did 100CM today second try. First try I had to swap to spellbreaker, so I took banner for elite because of not needing boonrip. Managed to get a clutch double ress with the banner on artsariiv, but sadly the group just couldn't stay alive, I had a druid running the -10% damage food instead of bountiful, so the healing wasn't great. Disbanded..
Second try on my druid, we got the kill on artsariiv. The trouble is in a pug people generally don't move together so I was trying to heal people left right and center. Ended up bringing search and rescue, traited search and rescue and also used spirit of nature to clutch ress and carry the group. I have got to say the encounter with artsariiv was absolute cancer with the bombs and the poison, but, I actually kind of like the new random instabilities. As much as I was annoyed with the cancer everywhere, it was a nice challenge. Maybe it would be an idea to remove the knockback from the bombs and just make them do damage instead, because its the bombs chain cc when there are loads of adds which catch you. I don't mind it though, it's not that difficult. These instabilities changed at the reset (a bug i guess) . For example, now we have last laugh + hamstrung + flux bomb in cm 100. Not so bad compare to yesterday... U know I said I won't gonna do cm for a bit? I'm gonna try it today again.. geez this is horrible.. what am I doing to myself? I assume they sort of hotfix changed the instabilities combo. At least now it's doable. Flux bombs prompts you to react quickly. Last Laugh makes you dodge, and Hamstrung encourages you to be good or be punished. Yesterday's toxic trail was cancer on 2nd boss because the small adds could both explode and leave trails, significantly applying damage over time. I miss the months when fractal dailies were FUN & CHILL to repeat (if your group was decent). I personally don't find the current random instabilities exciting or fun or rewarding at all because we get the SAME REWARDS. I hope the fractal team tweak some instabilities PLEASE. I would assume 99CM and 100CM deserve special consideration before adding random instabilities? because they're already on challenge mode. This is from a player who has been doing CMs + T4 (+often recs) for 5+ months every day. I had plenty of no death runs in CMs, 188 essences + 1 red infusion. I do fractals a lot. Excluding raids on my weekends, fractals are what I spend 70% of my daily game time on. I have killed all raid bosses too. Just wanted to say I'm competent. Yup totally agree with above. CM's should have very careful consideration when adding random stuff to it. Im assuming they worked very hard to make a challenging, but most importantly, fair and rewarding experience for ppl running cm's. Now what they have done is made some weeks virtually unplayable for all except the small group thats ran them everyday since their launch. Now I see it happening already ppl are going to require astronomical amounts of essences + titles so pugs are going to be impossible to join for probably 80%+ of the playerbase. My guilds are all pvp and none of my friends play video games, most ppl my age dont, so my gameplay is essentially always a pug. I was just starting to get into running these cm's and really enjoying them, now this. 99 wasnt bad though ill agree with that but 100 seemed so absurd from all the horror stories I didnt even want to attempt it, not that i even saw a single listing for it. I really wish mmo developers would adopt the "if it aint broke dont fix it" attitude. Has anyone ever in the history of this game complained that cm's were way too easy and needed adjusted in that direction, of course not, most everything i read was it's too hard or buggy. It was in such a good place, man I hate when this happens to a game I was enjoying. It always does to, just as I really start to enjoy something it gets ruined. Yeah good point at least we wont get screwed for an entire week. Also on the other hand we will have some weeks where they might randomly be easier although I dont remember any instability even being an issue on cm's. Last laugh on 99. last 15% hallucinations also explode on despawn. YAY! Edited I had a mixed up.